Citing "Central banks are being cornered into prolonging monetary stimulus as governments drag their feet and adjustment is delayed", the BIS (Bank for International Settlements) on Sunday, June 24 endorsed the proposals of forming a single banking union for the Euro Zone to "buy time" in the short term. After the election of a pro-bailout government in Greece, the markets now have shifted focus towards the two-day European Union (EU) summit later this week on June 28/29. At a meeting in Rome, leaders from Germany, Spain, France and Italy agreed to press for a €130 billion ($163 billion) plan at the summit. As we previously predicted, the $125-billion 'Spailout' did not give markets much comfort. Despite the massive bank bailout, rating agencies are still busy downgrading major global banks. Spain government 10-year bond yield shot up above 7.3%, and Euro-era high, before dropping to 6.4% last Friday on the hopes that European policymakers are moving towards a resolution for the euro sovereign debt crisis. Italy's borrowing cost also officially crossed the 6% mark, before settling at around 5.8% on Friday. Typically, economists see anything over 6% as unsustainable in the long term. So now Italy has become a serious euro bailout contender. 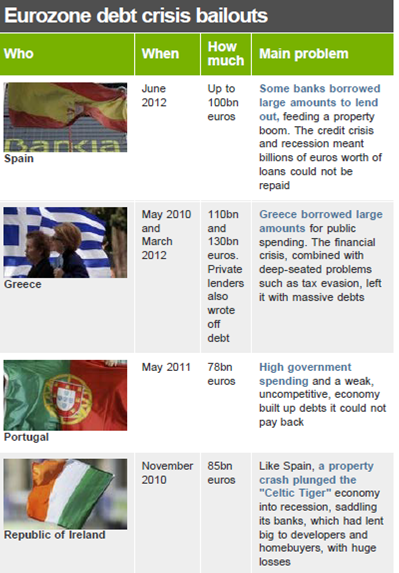 Italy does not have as bad the spending deficit problem as Greece, and its banks are in a better shape than Spain's. But the country could have problem serving its €2 trillion of debt (about 109% of GDP) as it has to borrow €35 billion a month. The bottom line remains that there simply isn't enough money under current bail-out arrangements to rescue Italy when the time comes. Most central banks around the world have kept its benchmark lending rate at a record low since the 2008 financial crisis, which is an unprecedented long period of time. Although the official version is to shore up economic growth, the reality is that these extraordinary monetary easing measures are mainly in place to subsidize banks since the majority of banks around the world are technically insolvent due to years of over-leveraging and reckless risk management. Similarly, almost every country in the world is in some form of insolvency from decades of deficit spending and debt financing/printing. Despite all the Euro Bond, Euro Banking Union, bailouts, and Operation Twist in the world, they will not change the inescapable conclusion: Deficit Spending does not work. Countries are no different from individuals. Ultimately, each country has to spend no more than it's taking in as income. Staying on its current course, the world eventually could be divided into three camps: bankruptcy (aka bailout), credit counseling (aka government austerity and household deleveraging), and debt renegotiation (aka "haircut"). PIIGS are only the beginning.